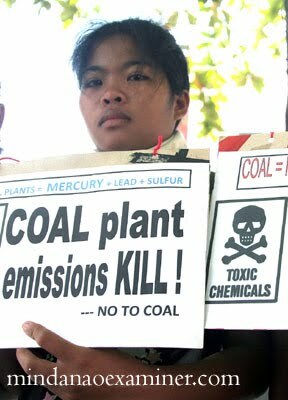 DAVAO CITY, Philippines (Mindanao Examiner / May 6, 2011) – An international environmental organization Greenpeace on Friday urged Filipino officials to reject proposals to build a coal-fired power plant in Davao City in Mindanao Island because of its harmful effects to humans and ecology. It said coal-fired power plant is a clear threat to sustainable development in Davao and the rest of Mindanao and called on the local council to instead focus in developing the city’s vast renewable energy potential. “Coal is the dirtiest fossil fuel and a main driver of climate change. There are hundreds of examples around the world where communities around coal plants suffer the impacts of environmental damage and health problems,” Greenpeace Southeast Asia campaigner, Amalie Obusan, said. Lia Jasmin Esquillo, of the group called Dabawenyos Ayaw sa Coal, said they are also opposing the putting up of coal-fired power plant in Davao, branded as “eco-tourism” city. Esquillo said carbon emitted by coal plants is hazardous to health and detrimental to Davao. “Coal is a finite resource and we are hostage to its world market prices. On the other hand, most renewable energy technologies don’t need ‘fuel.’ Some forms of renewable energy in the Philippines are already broadly competitive. We don’t see the point in pursuing a new coal plant when it will only become more costly, not only in terms of the fuel, but from its effects on the health of people and the environment as well,” Esquillo said. Davao is the largest city in Mindanao and recognized as the most livable city in the Philippines. Greenpeace said data from the Department of Energy shows that there is already a 50-MW (megawatts) geothermal energy project committed for Mindanao that will be operational by 2014 and another 300-MW of indicative renewable energy projects scheduled for 2011-2017. It also cited data from the Philippine Solar Power Alliance which show that as much as 100-MW of solar service contracts for Mindanao have been submitted to DOE just last month. In addition, Greenpeace said data from the National Grid Corporation also indicated that the strengthening and upgrading of transmission lines in Mindanao is now on track. It said while Davao is best-placed to harness renewable energy, coal power companies are brazenly trying to exert influence to keep the city dependent on harmful fossil fuels. Aboitiz Power is proposing to put up a 300-MW coal-fired power plant in Toril district. In Zamboanga City, Conal Holdings is also proposing to build a similar power plant to augment local energy requirements, but environmentalists were opposing the move, saying it will bring more harm than good. Zamboanga’s daily power consumption is about 78-MW. And last year, the local electric cooperative got only half of its total requirements because of the El Nino weather phenomenon. Conal is proposing to build a 100-MW coal-fired power plant in the village of Talisayan. But this early, some local lawmakers and pro-environment groups are already opposing the proposal. Councilor Cesar Jimenez said there is a need for a public consultation so the locals would know the ill-effects of pollutions caused by coal-fired power plants. “Since the city mayor and some of the city councilors openly support the establishment of a coal-fired power plant in our economic zone, the challenge is for them to conduct series of public consultations and forums on this matter and they should be ready and willing to face those opposing the project,” he said. Conal Holdings has already signed a memorandum of agreement with the Zamboanga City Freeport and Economic Zone for a feasibility study report on the proposed $250-million fossil-power station. It was also seeking a so-called “no-objection” resolution from the Zamboanga City Council. Pro-environment groups said coal-fired power plants are the single largest stationary source of pollution in any country. The toxins these coal fired power plants produce severely damage both human health and the environment and contribute to a reduced quality of life. Coal-fired power plants are responsible for release over 85% of total global carbon dioxide emissions, a prime contributor to global warming. Emissions from these power plants contain tens of dozens of toxic chemicals and the pollution they release every day are a major threat to human health and environment.